School SMS attendance system is very popular these days. Numerous schools and universities have successfully implemented it. This article can help you to choose whether you need to implement SMS based school attendance systems in your institution in case if you have not implemented it yet. A school attendance system is a product that is utilized by teachers and school administrators to monitor daily attendance of students and staffs. A school attendance system that uses SMS for attendance notifications is much popular than a regular attendance system since it encourages parents and administrations to be informed about their child's attendance status in real-time enhancing the security of children. Such systems encourage teachers and school administrators to efficiently manage and track regular attendance as well. The traditional attendance strategy is time -consuming and tedious. By utilizing an RFID device alongside a school attendance system taking attendance is less complex than ever. Students simply need to punch their fingerprint to the RFID system and the attendance will be recorded. 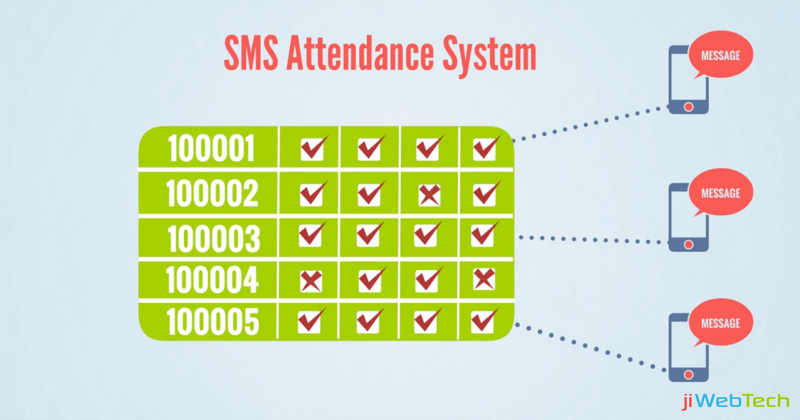 SMS based attendance systems can send attendance notifications to parents and school administrators in real-time, which will expand the general attendance percentage. Traditional attendance system relied upon attendance books. Each class would have one attendance book for them. With regards to preparing cumulative attendance records, it is double work. By using an attendance software, cumulative attendance records can be easily generated. An attendance management system needs the physical presence of a student to record his/her attendance since it utilizes biometrics for recording attendance so proxy attendance can be decreased. Many school management systems contain dedicated modules for attendance management. jiSchoolERP has a brilliant module for SMS based school attendances. It can record, track and manage students' attendance rapidly and efficiently. Check out the attendance management system features to know more about it. Sign up a free demo.